I am following up on yesterday’s Tourist Tuesday on geotagging. Many people are under the mistaken idea that if they simply don’t #hastag the photo with its location, they are doing their part to not #geotag. That is unfortunately, not true. First thing you need to do, before following the advise below, is go to settings on your phone and make sure you are not broadcasting your position every where you are. You can turn off location settings for all apps except those needed. For example, I have location settings turned off for all but maps and a very few others that I use as maps, such as yelp. I don’t need facebook or twitter or whatever to know where I am. Do you? Did you know that most cameras embed hidden information, called metadata, into every photograph taken? And when you share those images, say by uploading them to a social network, or instagram, or wherever you do, that hidden information often stays embedded? And that people can view said information for almost no effort at all? This metadata is called EXIF data (Exchangeable Image File Format) and is harmless in most cases, but can be used for nefarious purposes (NSA uses it with OUR photos!) and to find the location where you took the photograph. So, in effect, you are geotagging every photo you upload, IF you do not “scrub” or remove the EXIF data or Meta Data. If you take most of your photos on your phone, then it may make more sense to use an EXIF-removing app instead so you don’t have to involve your computer in the shoot-edit-upload process. Before you install a third-party app, first check your Camera app’s settings to see if you can disable EXIF data generation. Some camera apps may only let you disable location inclusion, while others may not allow you to disable EXIF at all. Still need an EXIF remover? 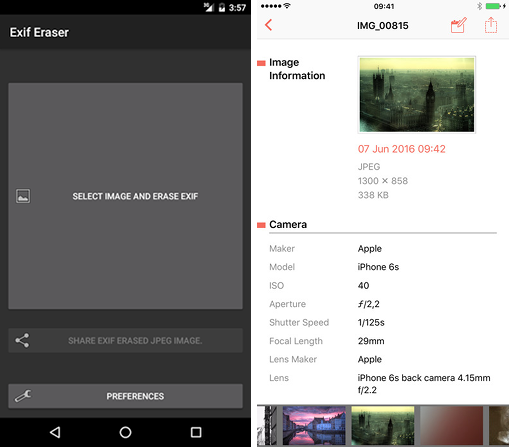 You can try Exif Eraser for Android or Metapho for iOS. Both are free to download, but Metapho requires an in-app purchase to unlock the ability to remove metadata, edit date and location, and share safely to social networks. I downloaded the Metapho for my iPhone, and then went ahead and paid the $3.99 cost for the ability to remove ALL meta data for any photos I will upload, unless it is clear I am posting about specific spots on Highway One that I am otherwise identifying. To me, it is worth that minimal cost to make sure any and all photos I post on WordPress, FB, twitter, and instagram are scrubbed of all meta data. ~ by bigsurkate on December 19, 2018. Very helpful, Kate. I already scrub photo data…through using my computer before posting my camera pics…but not the ones I post from my phone. Need to look into that and turning off general location for posts. Thanks. Very helpful for those of us who travel “off-road” and brushcrash, taking photos. It certainly can’t hurt to scrub images, but leaving location data in the images isn’t that bad for the more popular social networks these days (it was different a couple of years ago). Facebook and Instagram both use any geo data in an image you upload, but only to suggest a (somewhat generic) location that you might want to tag your image with (eg, Big Sur). End users will not be able to get at the lat/long of a post (both entities scrub the Exif data from the images of yours that they actually post as part of their resizing and dumbing down the quality of the image process). Of course, they’re probably also using the lat long to figure out where you are and use it themselves to allow advertisers to target folks that are in certain locations etc. Twitter appears to be all “opt in” on geotagging (photos and regular tweets), so you’d have to jump through a few hoops to get things tagged in the first place.